The package sat at the front door, propped up against the bricks like a bum looking for a handout. Inside -- culinary gold. If food culture could have a time capsule, this book is it in hardback, glossy form. This is how we ate before convenience foods and Condensed Soup Casseroles. The ingredients, for the most part, are inexpensive. The preparation is simple. 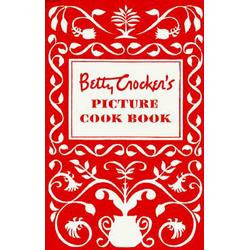 Our story begins a few weeks ago when I sent in a response to an insert in the paper offering reprints on the 1950 edition of Betty Crocker's Picture Cook Book. Cookbooks are to me what gold coins are to Leprechauns -- ye canna evveh hae' enough. I have my grandmother's one cookbook: the 1938 edition of The American Woman's Cook Book, which is so back-to-basic, it tells you how to render your own lard and kill your own chicken. 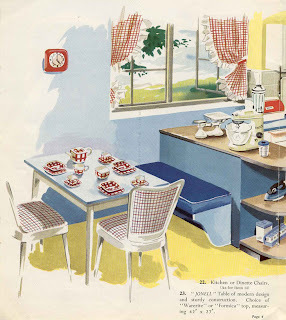 I thought the 1950s model from Betty Crocker would be a nice gap-filler between post-Depression U.S. and the trendy food books I gather like lint. The book had arrived and awaited me on the porch. That night, after everyone had gone to bed, I sat down with what has become my new BEST WEDDING GIFT for 2008. This thing is a gold mine, not just of recipes from yesteryear, but a snapshot of how a huge segment of American society used to live. Or tried to live. Breaking down the recipes: The organization is brilliant. Each section features a series of Master Key recipes for basic elements any self-respecting housewife would make in 1950. (No sexism intended, but this book was made for housewives of that era. Some tips also are clearly geared towared women who had "help.") From those key recipes, there are dozens of variations. Master the basic recipe, and the world was your oyster. Or sponge cake. Such simplicity reminded me of the dishes my grandmothers used to make. That was the day when there was probably only one cookbook in the house (this one), and every meal was from-scratch homemade. Later in the 1950s and 1960s, the Condensed Soup Casserole and convenience foods would descend upon American kitchens, and we would never be the same. There are hundreds of recipes, almost all of which would still be relevant and useful today. Breaking down the pictures: The step-by-step photographs would be invaluable to the folks (generally younger) who call in wanting to know how to do some basic techniques. The color "beauty shots" of the dishes show the trouble people used to go to for everyday dinner. Then there are those delightful 1950s-era line drawings. Totally Americana, totally retro. Interspersed are gems of history, trivia and food knowledge. Of course, the raging feminists among us will be outraged -- YES, OUTRAGED -- at the suggestions for houswives on how to have cheeful household. Moms (yours truly included) will snicker at the idea of knitting or listening to relaxing music while the children nap. Wives of all stripe will say, Yeah, right, to the idea of noting interesting events and sights that can be related at dinnertime conversation. Or the idea of going to the market "in person" whenever possible. Still. That was the way of the day, at least for an upper to middle-upper crust society.